I received a pair of small bookshelf speakers for review recently that required stands for their setup. Unfortunately, the only thing I had in the house at the time was a pair of cheap 20" stands that werent quite tall enough to do the job with these particular speakers. Normally, I would make my own stands from .75" MDF, then veneer and stain them, but my schedule of late has kept me out of the woodshop. There was no choice; I had to look at other options. I shopped around town to see what was available and the only stands I was able to find consisted of four pieces of cheap, vinyl-wrapped particleboard at $50 or so, and some spindly steel stands that ran from $70 up to about $90. None of these was heavy or stable enough to securely anchor itself and a speaker while sitting on heavy carpet and a pad. So, once again I took my search to the Internet, which led me to Parts Express. Having purchased products from this company in the past, I was already familiar with their reputation for quality and value. 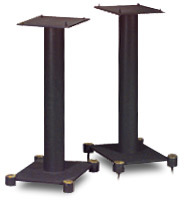 What I didnt know was that they sold speaker stands in various sizes and quality ranges. Eventually, I settled on the 24" "audiophile grade" stand (part number 240-744), their top-of-the-line speaker stand at $97.80 per pair. There are two other stands in the same line: one 18" model (240-748) for $92.25 per pair and another 12" high (240-749) for $87.80 per pair. All three stands are virtually identical except for the overall height, so comments about the 24" stand should apply equally to the other two as well. I ordered the stands online directly from the company and within a few days I had a 53-pound box sitting on my front porch. The stands arrived in good order, which was a little surprising, considering that the box looked as though it had been through a pitching contest somewhere along the way. The relatively heavy box was badly mangled and had two tears along one edge, yet the contents were unscathed and all of the parts were there. The stands come disassembled, so be prepared to spend a little time setting them up. The unassembled stands consist of a heavy 3.5"-diameter center post, a 9" x 10" top plate, a 9.5" x 11.75" bottom plate, four 1.5"-long spikes for the base, and four smaller adjustable spikes for the top plate. Both the top and bottom plate are .375"-thick solid steel and are quite heavy by themselves. The bottom plate has a round "foot" at each corner that the spikes screw into, providing a slightly wider base than would be possible if the spikes were placed inboard of the outside edges of the plate. The feet are each adorned with an attractive brass cap. The rest of the stand is finished in a utilitarian, but attractive, black crinkle finish. The top plate includes provisions for installing a small adjustable spike at each corner that can be used to couple the speaker to the stand and provide a small amount of tilt, if desired. I affixed my speakers to the stands with a small blob of Blu-Tac at each corner. Assembly is simple enough. Attach the base to the closed end of the tube with a large screw, and then attach the spikes to the base. Parts Express states that the floor spikes are adjustable, but they lack locking nuts, so getting them to stay adjusted may prove to be a challenge. I screwed mine all the way down and left it at that. Once this is done, fill the center column with sand or lead shot, or some mixture of the two. I filled mine with "play sand," available at the local home center for less than $5. Each stand took about a third of a 50-pound bag of sand. Once the column is filled, align and attach the top plate and install the speaker spikes, if desired. Both plates could use an alignment tab that would mate to an indentation on the center tube to aid in alignment, but I was able to line them up fairly accurately by eye the first time out and only had to make minor adjustments. Thats all there is to it. The completed stands actually measure almost 26" in height with the spikes installed, and weigh in at about 40 pounds each (with the sand). When filled with sand they are extremely sturdy and stable. Given about a day to settle into the heavy carpet in my listening room, it would take a pretty hard hit to push these stands over, and once the center column is filled, theyre basically inert. The performance of the stands, with all of the speakers Ive had installed, has been consistently good. They provide a stable support system with the ability to make small adjustments via the included speaker spikes, which may aid the imaging qualities of certain speakers. I can think of only two things that would improve them: an opening on the back of the center column to handle cable management, and locknuts for the floor spikes. If youve invested a fair amount of money in a pair of quality monitor speakers, why entrust them to flimsy, unstable particleboard stands when, for just a little more money, you can put them on a solid, quiet foundation? Most other stands Ive found of this weight and quality cost two to three times the price of the stands from Parts Express. That makes these an easy recommendation and a sound investment in your stereo system.